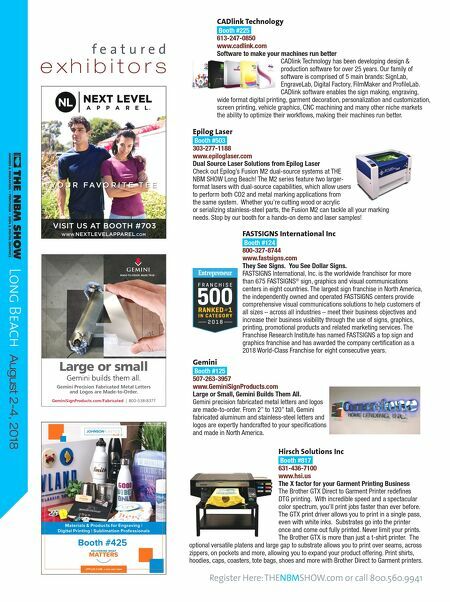 Materials & Products for Engraving | Digital Printing | Sublimation Professionals Booth #425 JPPLUS.COM • 1-800-869-7800 Gemini Precision Fabricated Metal Letters and Logos are Made-to-Order. GeminiSignProducts.com/Fabricated | 800-538-8377 MADE-TO-ORDER. MADE TRUE. ™ Large or small Gemini builds them all. f e a t u r e d e x h i b i t o r s Register Here: THENBMSHOW.com or call 800.560.9941 Long Beach August 2-4, 2018 Epilog Laser Booth #503 303-277-1188 www.epiloglaser.com Dual Source Laser Solutions from Epilog Laser Check out Epilog's Fusion M2 dual-source systems at THE NBM SHOW Long Beach! The M2 series feature two larger- format lasers with dual-source capabilities, which allow users to perform both CO2 and metal marking applications from the same system. Whether you're cutting wood or acrylic or serializing stainless-steel parts, the Fusion M2 can tackle all your marking needs. Stop by our booth for a hands-on demo and laser samples! Gemini Booth #125 507-263-3957 www.GeminiSignProducts.com Large or Small, Gemini Builds Them All. Gemini precision fabricated metal letters and logos are made-to-order. From 2" to 120" tall, Gemini fabricated aluminum and stainless-steel letters and logos are expertly handcrafted to your specifications and made in North America. FASTSIGNS International Inc Booth #124 800-327-8744 www.fastsigns.com They See Signs. You See Dollar Signs. FASTSIGNS International, Inc. is the worldwide franchisor for more than 675 FASTSIGNS ® sign, graphics and visual communications centers in eight countries. The largest sign franchise in North America, the independently owned and operated FASTSIGNS centers provide comprehensive visual communications solutions to help customers of all sizes – across all industries – meet their business objectives and increase their business visibility through the use of signs, graphics, printing, promotional products and related marketing services. The Franchise Research Institute has named FASTSIGNS a top sign and graphics franchise and has awarded the company certification as a 2018 World-Class Franchise for eight consecutive years. 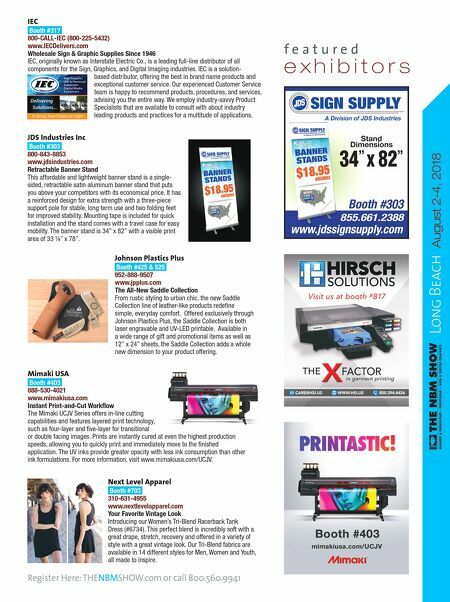 Hirsch Solutions Inc Booth #817 631-436-7100 www.hsi.us The X factor for your Garment Printing Business The Brother GTX Direct to Garment Printer redefines DTG printing. With incredible speed and a spectacular color spectrum, you'll print jobs faster than ever before. The GTX print driver allows you to print in a single pass, even with white inks. Substrates go into the printer once and come out fully printed. Never limit your prints. The Brother GTX is more than just a t-shirt printer. The optional versatile platens and large gap to substrate allows you to print over seams, across zippers, on pockets and more, allowing you to expand your product offering. Print shirts, hoodies, caps, coasters, tote bags, shoes and more with Brother Direct to Garment printers. CADlink Technology Booth #225 613-247-0850 www.cadlink.com Software to make your machines run better CADlink Technology has been developing design & production software for over 25 years. Our family of software is comprised of 5 main brands: SignLab, EngraveLab, Digital Factory, FilmMaker and ProfileLab. CADlink software enables the sign making, engraving, wide format digital printing, garment decoration, personalization and customization, screen printing, vehicle graphics, CNC machining and many other niche markets the ability to optimize their workflows, making their machines run better.